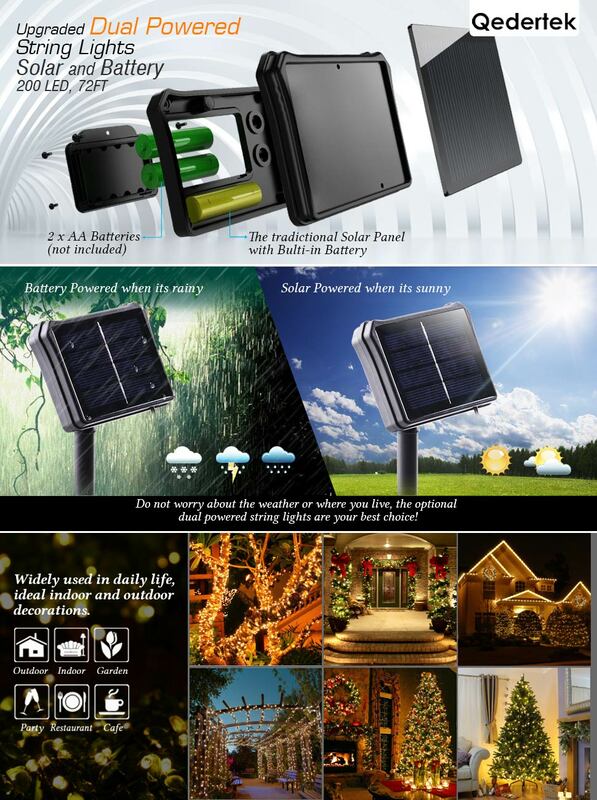 solar powered when it’s sunny; battery powered when it’s rainy. 200 LED mini lights on a 72ft string, decorates your home and garden with cool white light, brighten up your parties and holidays! Two buttons on solar(Power ON/OFF, Light Mode), sensor technology inside the panel, auto-on at dusk, auto-off at dawn. With the waterproof feature, the dual powered string lights is perfect indoor and outdoor decorations, such as home, garden, bedroom, porch, roof, party and more. Do i have to wait for the solar panel to charge before the lights come on? i put in the 2 aa batteries, pushed the power button, but nothing happened. Mine came with the batteries in it so didn't have to do that but yes it does need to charge out in the sun. I'm in snow country so on snowy days that don't get much sun and don't last very long. Good luck. Do the aa batteries kick in every night when the rechargeable battery is drained? and if so how long will the aa batteries last? Yes, they last all night with the solar rechargeable batteries. ok this is a dumb question, but do you have to turn the on/off switch on for the solar to work or this just for the batteries? When turned on they automatically come on at dust and off at dawn. Do the AA backup batteries get charged through the solar panel as well?